The purpose of a french drain is to help eliminate standing water in low lying areas of your yard and to absorb excessive amounts of moisture in the soil. The are some limitations to if and when a french drain can be installed. The existing conditions of the landscape/grading have a lot to do with the effect and performance of any proposed french drain. If you think your property may benefit from a french drain give us a call. We will come out to set up a laser to determine existing grades if required and design a system that will work best for your specific needs. 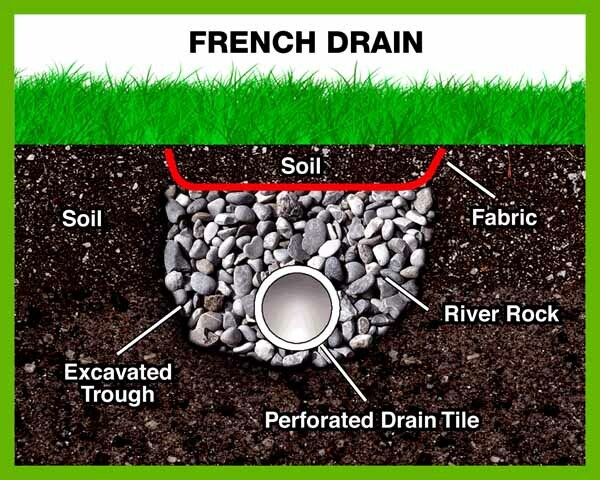 The most common form for a french drain is a trench being dug with a pipe located toward the bottom packed with gravel. We have been installing french drains for many years and have discovered a few tricks to ensure that the maximum amount of service life from the drain will be achieved. In some situations where trees and other plant material maybe a concern we may recommend a box drain system instead of a french drain to deter root growth in the system . We don’t recommend a downspout drain be connected to a french system near the foundation if at all possible. Water back ups can direct excessive amounts of water into the soil around the home and cause major damage if the problem persists or goes unnoticed. If you think your property may benefit from a french drain feel free to give us a call at 614-989-3326.